The hound’s howls alerted me to a package at my doorstep on Wednesday. 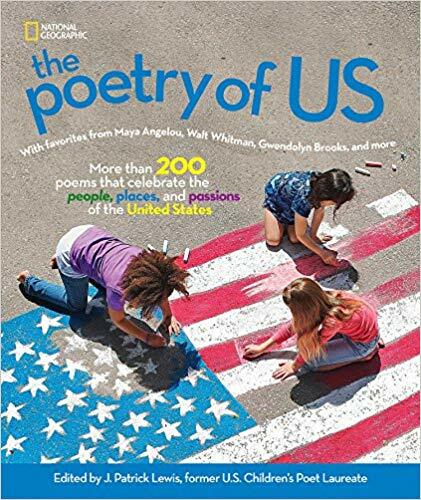 I added my own howls of joy as I tore open the package’s cardboard wrapper and found a copy of J. Patrick Lewis’ newest National Geographic anthology–The Poetry of US. I’ve only begun dipping my toe in this book, and plan to spend time savoring its many poems (more than 200!) and photographs. The anthology takes the reader on a journey across the United States, sharing the beauty, diversity, and challenges of our country. It’s impossible not to feel a sense of wonder and delight as you flip through the pages, traveling around this complicated country of ours. And for me, it’s a needed antidote to the divisiveness and discouragement of the daily news cycle. The book begins with poems celebrating symbols of the United States (Joyce Sidman’s “Our Rose” and Steve Withrow’s “Naming the American Eagle” are both a pleasure to read) and continues with new and old poems of what divides and unites us, by Carole Boston Weatherford, Walt Whitman, and Langston Hughes. Then the book starts its epic geographical journey, beginning in New England, reaching across the Midwest and Great Plains, traveling to the Pacific and beyond to the US Territories. Along the way we learn of history and holidays, festivals and food, wildlife and wild places, and the struggles and triumphs of people who live in towns and cities. One of the great joys of having a poem in this volume is sharing space with poetry friends, some of whom I’ve met in real life and other who I know online. The members of my online group of poetry encouragers/critiquers all have poems in The Poetry of Us. They’ve generously given me permission to share their poems, which I think give a hint of the span of the anthology. I hope you’ll check out this terrific anthology that includes poems by many Poetry Friday regulars. Order it online or from your local bookstore, or request it at your library. This entry was posted in Uncategorized on October 5, 2018 by Buffy Silverman. What fun to see so many familiar names in one comprehensive anthology! Thanks for sharing a few. I especially enjoyed the images of tulips painting the city, the field of wooden shoes, and springtime skipping. I’m so sad I’m not part of such a splendid book. I would have loved to write about the Highland Lilac Festival in Rochester, NY. Looks like a wonderful book. I hear you, Brenda. There have been many anthologies that I haven’t been invited to submit to, and felt sad about. In fact, the only reason I got into this one was that a friend yelled at me about not contacting Pat Lewis and asking to be considered for future anthologies–and fortunately for me, he still needed a couple of poems. I am not very comfortable putting myself out there, but am trying to change that! I think Laura Salas had a post a while back about how to get invited to submit to anthologies… you might want to ask her for the link. So happy for my poems to be in such great company! And thank you for letting me share your poem, Michelle! I love the way it floats on the page with all that folklorico color! Congratulations on your poem. It blooms with tulips! I enjoyed my visit to Holland even though it was summertime instead of tulip time. Thank you for giving several peeks inside this anthology. It looks like a keeper! Thank you, Kay–it is indeed a keeper! The feeling is mutual, Renee! 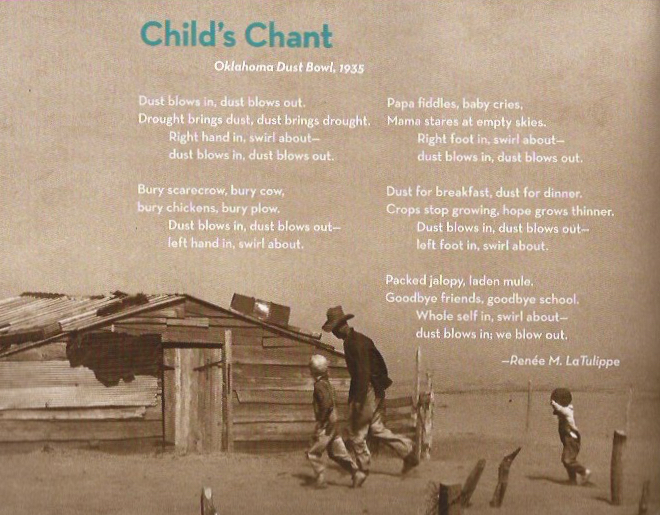 I am amazed at how you captured a child’s voice in this poem and still kept true to the tragedy of the dust bowl. Your poem describes the festival as I imagine it to be. The color must be stunning. Congratulations and thanks for sharing! It is a colorful festival! Thanks to you for stopping by and reading, Diane. I am so incredibly humbled to be in this amazing anthology. Wowza! What a joy to hold this collection in my hands. 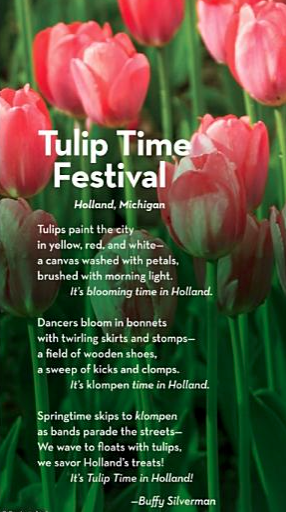 I love your dancing Tulip Time poem. I’d love to just hit the road and go to all of these places. 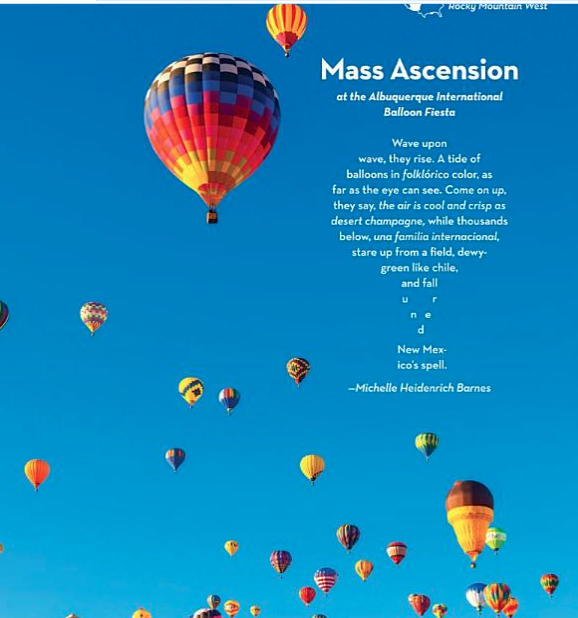 Wouldn’t it be wonderful to visit all the places featured in The Poetry of US, Margaret? I am enjoying the armchair version of the journey. Buffy–Congratulations! What a great looking book–can’t wait to get my hands on it. I’ve never visited the Tulip Festival but your perfectly rhymthmic poem makes me see how much fun it could be! Well done. Thanks, Rebekah. The book really is a treasure. This book sounds like virtual treasure trove!! Must get my hands on a copy soon. Meanwhile, enjoyed all the sample poems you shared. Wonderful to see so many PF friends included! It is wonderful to flip through the pages and see so many familiar names! Even though I have a poem in it, I hope it’s okay to say that it’s a truly gorgeous book. A reader could spend hours and hours exploring in it. I love the romping rhythm of your poem, Buffy, and thanks for sharing mine! Love your poem! “…defying the dark” is so perfect; the whole thing leaves such a great feeling of waiting expectation! I agree, Liz–it is a stunner. Thanks for letting me share your menorah’s voice. What’s fun about anthologies such as this is the family reunion “feel” of so many familiar PF poets. I love seeing the wide variety of poems from friends. Many congratulations for your poems included in this beautiful book. I really do think I need this book as someone who writes … and as someone who teaches. From New Mexico’s skies to Oklahoma’s dust to the glowing family behind the menorah to Holland, MI I feel like these are my places, my people. Thank you! 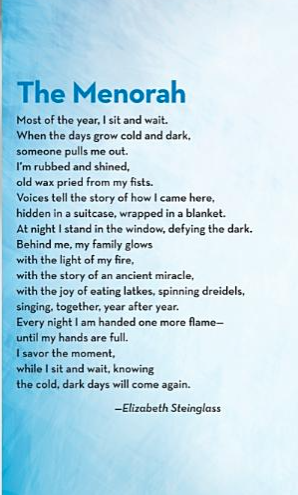 Thanks, Linda–I could see sharing a poem a day with your students, or tying it in to social studies and all sorts of other lessons. Thanks for giving more inside peeks int this amazing book – and congratulations on being a part of it. Thank you, Sally–it is a delightful book! What a celebration of words and images. These are each so beautiful – and unique. And Holland Michigan! I have been there!!! I spent a white Christmas in Holland (have the clogs to prove it :P) in 1990. Loved it! I would not have expected little Holland to be on an Aussie tour–but it is a cute town, and there are many beautiful beaches nearby. I like the three related refrains also, congrats! Thanks for your rich review of this new anthology and for also including Michelle’s, Renée’s, and Liz’s poems too! Congrats for your own wonderful poem, Buffy & thanks for sharing the others, too. It looks like a marvelous book. It is, indeed Linda–really a book to savor. It’s so wonderful to see so many Poetry Friday friends represented in this anthology, and it’s also such a wonderful antidote to all the negativity we keep being bombarded with. I hope so, Jane–I for one need to tune into more poetry and less negativity.